Due to the law changes, DSGVO/GDPR, my blog got a little makeover on the outside, and a huge one on the inside. As you might have noticed, my blog was offline over the past few days. I was busy to read myself into the new law stuff, to understand what I was reading and what it literally meant for me and my blog Inkvotary. At times it was nerve-racking to deal with and it took me some days to adjust to it as best as I could. I had to make some decisions, concerning Inkvotary and its appearance as well as to work my way to all the technical things to make Inkvotary as DSGVO/GDPR compliant as possible. At least from my side. Some of those things I had to change will probably apply to you too. 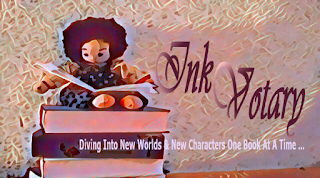 If you follow Inkvotary e.g by eMail keep reading. My blog is still a “work in progress” since I have some smaller adjustments left to check and change, but with new books arriving each day and some reviews that need to be brought online, I didn´t want to keep Inkvotary any longer offline. The changes I made (so far). During the past days, I threw out Google´s original follower-gadget and replaced it with the graphic-link you can now see on my blog´s sidebar. And to be honest, I like that look much better though I can´t see your lovely pictures anymore. But as long as I know that you are still with me, I am happy. Another change is, that you won´t find any reading widget, at least for the time being, on my blog anymore. Goodreads hasn´t responded to my email yet and it doesn´t respond to its members and their questions on the forum as well. The only answer they give is the usual blabla which isn´t really convincing. I might install the reading-widget a German forum called Lovelybooks is offering (if I can find the English editions of books I read there as well). So far, no decisions made yet. Also, not sure is, if I keep the Follow-By-Email-gadget. I am still thinking about it since it seems to be one of those things that are in a judicial grey zone. Some say so, others say so. And lawyers aren´t sure about it either. You get it, I guess. Currently, I am looking closer into an alternative I found, but I need a bit more information before I will speak about it. I am testing it right now and as soon as I made a decision whether or not, I will tell. If you like to follow my blog via RSS-Feed, you can of course still do that. You can either use the subscription Posts (Atom) link at the bottom of each page or click on the RSS sign at the top of my About Me section. I will post something about it soon with a bit more information for you. Just note that the RSS works best when you use the browser Mozilla Firefox. At least that´s my experience with it. Google Chrome is only providing so far, a confusing data salad. Hope they fix that soon. Looks awful to me *smile* And no, that is no commercial for those browsers. Just telling simple facts.